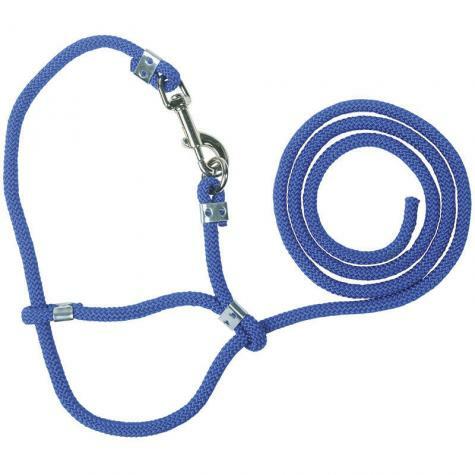 A braided halter to restrain lambs and yearlings. The headpiece snaps together behind animal’s head. 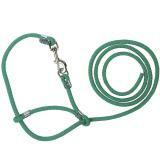 Note: Yearling halters have longer nose restraint for older/larger animals. 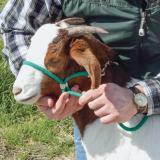 To restrain sheep, goats, and llamas for milking, adjusting or removing harnesses and administering medical treatment. Diamond-braided 3/8 in. 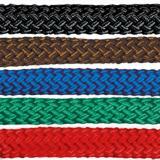 diameter rope is a step up in feel, function and appearance from twisted rope halters. Lamb: lead portion of halter is 42” long. Yearling: lead portion of halter is 48” long. 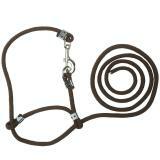 Excellent halter! Works great on my Angora Goats. Great price and fast shipping. 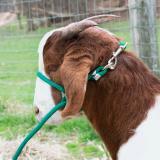 The perfect halter for my mature jacob rams. So nice to not have to try and get a strap over those horns! Much nicer than the cheaper nylon halters and they don't pinch the skin even when snug.